The European Commission titled one of its policy priorities the “Digital Single Market” (DSM). I applaud the aim of tearing down the many digital borders that remain in Europe – but I am convinced that if done right, it brings benefits to society far beyond facilitating commerce. Progress must directly benefit and empower all people, not just someone’s bottom line Tweet this! Today, the Parliament adopted its reaction to the DSM strategy. I worked hard to ensure, together with my colleagues, that in it, we cast a wider view: That in promoting new technology and international exchange, we don’t forget that progress and globalisation must directly benefit and empower all people, not just someone’s bottom line. The following points from the report are the result of this effort. Copyright exceptions and limitations allow everyone to build on the creativity that has come before, and to graduate from being a user to becoming a creator. They play a crucial role in enouraging new works, whether commercially exploited or not. The EU should therefore introduce Europe-wide minimum standards (#43) and create more clarity for user-generated content (#46). A well-formulated new Europe-wide exception for Text and Data Mining will make it easier for researchers and educational institutions to conduct modern research (#45) – and making all scientific research which is at least 50% funded by public money accessible and free (#102) will allow everyone to reap the benefits of our common investments. When it comes to market solutions, regulation is necessary to ensure that new technologies and commercial undertakings safeguard fundamental rights and empower workers rather than commodifying them (#81). Regulation may not, however, become a tool for powerful industries to prevent innovation. The main narrative around internet platforms coming from the Commission as well as my conservative colleagues in the Parliament seems to be that they are foreign giants unjustly harming European cultural industries, requiring us to come up with new fees for them to pay and new rights for them to clear, and make them into enforcers of these industries’ interests. However, on closer examination it turns out that it is often not so much culture that is under threat, but legacy business models. The report questions “internet platform” as one-size-fits-all category (#75), warns against creating barriers to market entry by introducing new obligations to cross-subsidise legacy business models (#72) and stresses that provider liability must remain limited (#73). Since the latest terror attacks, many politicians have been demanding that tech companies help enforce laws – by spying on all of their users and weakening the encryption that protects not just all of our credit card purchases, but also dissidents’ communications in oppressive regimes. The Parliament stresses that internet platforms mustn’t act as privatised law enforcement (#74), can’t be obligated to actively scan for illegal activity (#95), and that strong encryption is important (#92). The telecommunication regulators in Europe, unified at the EU level in BEREC, must enforce the recently passed Connected Continent package in such a way that the net neutrality principle is applied rigorously, ensuring the web remains open to any kind of service without discrimination, regardless of whether it’s run by a global corporation or you in your garage (#60). The Parliament highlights the web’s emancipatory potential, how important it is to encourage the increased participation of women in the information society (#113) and to ensure everyone has the skills and ability to access services, including those with special needs (#114) and the vulnerable (#115). 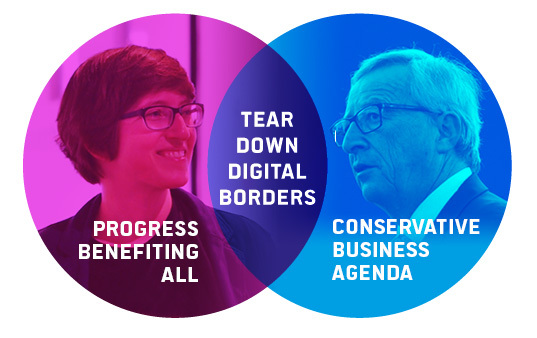 Let’s tear down digital borders that remain in Europe – to benefit everyone Tweet this! In summary, this report calls on the Commission to significantly broaden their current business-centric approach to digital policy. We must follow-through with this philosophy when the specific legislative proposals are before us in the coming months. i just added you to my web site “hall of fame” section. Nice blog!